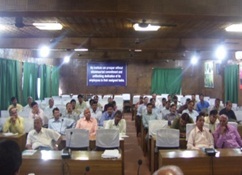 Established in November 2007, the Consortium for e-Resources in Agriculture is the first of its kind for facilitating 24x7 online access of about 3000 journals in agricultural and allied sciences to all researchers, teachers and students, policy planners, administrators and extension specialists in NARS through IP authentication. 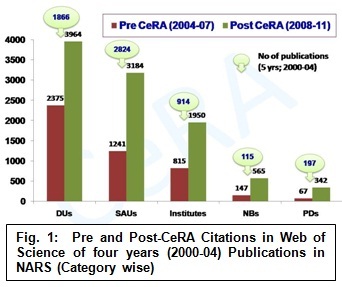 CeRA is the most sought after online platform by scientists/ teachers in NARS for literature search for their professional pursuit. Detailed information on CeRA is available from: http://cera.iari.res.in and http://www.cera.jccc.in. The quality of publications measured through NAAS rating and Web of Science (Fig. 1) showed improvement from the pre-CeRA establishment. 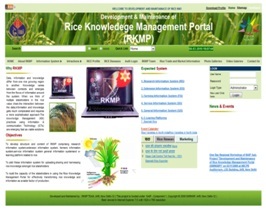 RKMP: RKMP: Rice Knowledge Management Portal (RKMP): A prototype of RKMP has been developed with SQL Server as backend and ASP.Net as front end (Fig. 2). Five information systems (General, Extension, Farming, Research, Service Information system) have been developed. Content for extension information system (EIS) and farming information system (FIS) have been collected and integrated with RKMP portal. Location specific FAQ Page designed. A web application including static and dynamic information was developed. Under the DBT programme on Biotechnology Information Services (BTIS), applications of Bioinformatics tools are being used to characterize sequences in genomics and proteomics. Currently, a web based application ‘Wheat Informatics’ has been developed which enables the target user to retrieve general, scientific, bioinformatics and other information on wheat. This application is user’s friendly and will help the students and researchers to know the details of the crop. For more details, please visit: http://bic.iari.res.in. A number of Bioinformatics software tools have been compiled and documented. Recently the Centre has developed Bioinformatics software tools like miRule, Micro RNA Designer, Rice Protein station and Plant Transmembrane Receptor Kinase Prediction Tool. Asset Management System and Leverage Management System are the two software developed to automate certain administrative activities. Under the DBT programme on BTIS, about 50 M.Sc. students have been imparted training from six months to one year in different areas of Bioinformatics. The Unit has so far, organized more than 25 training programmes covering about 1300 participants from ICAR Institutes, SAUs and different BTIS Centres.